The only reading I do besides captions, articles, tidbits, hardly enough books, news events, puzzles, and signage are recipes. I think I read too many. Any way this is my newest and most favorite. ? why..this booger has a story. The small young bird that I am preparing this year (9 pounds) is now 'resting' with a liberal dose of rosemary butter massaged under the skin and a generous coating of spices and salts to 'tighten' up the skin before cooking. The butter nut squash is already roasted and waiting to be mixed with cream for soup tomorrow. The homemade fresh sausage for the stuffing is waiting in the fridge. The green beans are still in the package but they will get handled later. Mashed potatoes always happen in the last 20 minutes anyway and the pie came from the store. Gone are the days when I experiment, like that year I did a goose...whew what a bad idea. This time of year is typically the time of year for tamales. 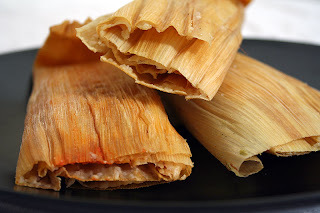 I am providing extra links for tamales since I am not so detailed in my explanation. I have been making these delicious little treats for years and years now and I dont follow a recipe so much as I just throw it all together. I started the meat last night in the pressure cooker with chiles, garlic, onion salt and pepper so that today it was pulled and shredded by hand and tasty. I made the masa, soaked the husks and got busy this morning making 2 dozen of these bad boys. I basically did the same as this. and Rectums. I dont need to tell you how good these are. The only way to get good food done fast is with a pressure cooker and I use it a lot. Some people say it isnt the same as slow simmering but I disagree and I disagree because I am so bad at slow simmering, instead of one hour I let it go for three so the whole effect is lost on the affect, or vice versa. With the pressure cooker I am on point, I know that within a few minutes its good to go. Today the kid asked for beef stew at 4:00 pm and he wants the meat to fall apart "like it always does" so since he likes to eat at 6:00 the only option is the pressure cooker. with olive oil and fresh lime. (translated - yucca (starchy root) bacalao (dried salted cod or pollock) gineo (green banana) cebolla (onion) This meal is so light and satisfying you will want to eat it everyday. Guests always give you the best perspective. With all the smells coming out of this blog it should be rated X. That durian, as frozen or de-scented or whatever was hardly mild and now today is no different. This cheese stinks but not nearly as much as the one I threw away. This one stinks like sweet creamy honey milk that is just a little south, but boy does it taste good. The other one an Explorateur, was so ripe even I couldnt eat it. So to lighten the load a little here are some pictures from a couple days ago at the most wedding photographed location in central park. Its at 105th and 5th and its the conservatory garden. It is so nice here that it is a shame that me and the little guy play hide and seek in the bushes. Oh well. 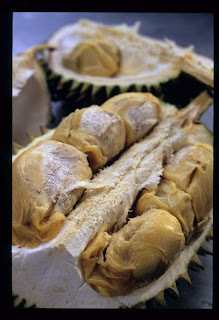 Durian, forget everything you have heard about it or havent heard or might hear later - it isnt that bad. Now I know, who wants to eat anything that is prefaced with "it isnt that bad" but seriously it isnt. Its creamy, sweet and pungent to be sure but I think the fact that it was ice cold kept some of its aroma to a minimum. I had already picked up the chicken the rabbit the fruits the veggies and whatever else I needed in chinatown when while we were at the car a vendor was carving into a durian. I stopped to admire his skill when he asked if I had ever tasted it and I said no while asking how much was a whole one. He said it is a dollar twenty per pound and a whole one is about 11 dollars but if you want I will sell you a large taste for one dollar. I whipped out a buck he carved out one of the seed pods and just like that I was eating durian. The pup said the texture was too wierd, banana loved it and I did too. We were watched closely by about several other vendors and they seemed to be waiting for us to freak out but all were pleasantly surprised when we seemed to enjoy it. So there you go.